Laboratory fume hoods are made to protect the human being by controlling the risk of fume inhalation. But the fume hoods provide almost little or no protection against the risk of fire. Though all laboratories may has fire retarding methods or procedures, still accidents can and do happen near the ignition sources like hot plates, burners etc. especially in fume hoods, where you cannot even use conventional fire system. 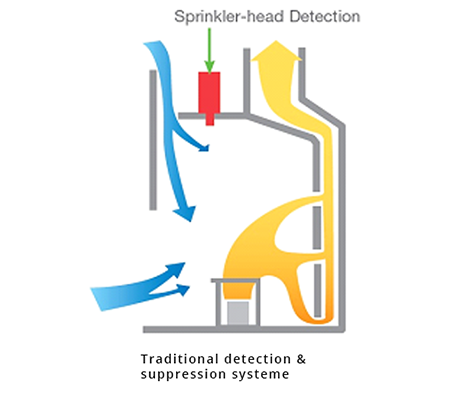 To deal with this problem Sciencebydesign brings you fire detection systems & suppression systems to protect laboratory fume hoods. Which detects & suppress a small fire before it grows, consumes the hood. The auto fire extinguisher system consists of a detection tube. This flexible, heat sensitive, polymer tube is mounted behind the baffle of cabinet. In the working condition of hood, if fire begins, the flames follow the airflow into the hoods baffle. 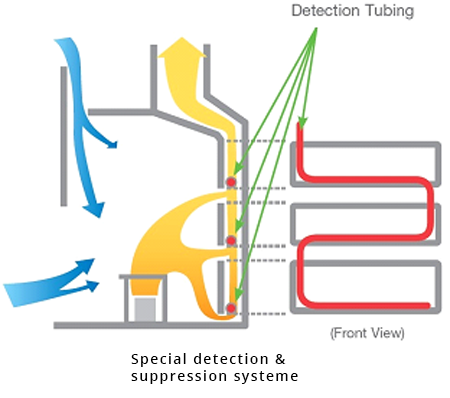 As this tubing is installed in a crisscross with the baffle, quick detection is assured. Hence it also assures the early detection of fire, reducing the risk of injury to laboratory personnel or damage to the equipment. This tube is then connected with a fire extinguisher cylinder which is placed nearby to the hood. Once the heat sensitive tube senses heat of approx. 100°C, it gets burst & triggers the fire suppression system. The best fire suppression agent for the application, usually CO2 or ABC dry powder, is directly entered onto the fire assuring quick & effective suppression.It can suppress fire in the sash open condition as well. The best of all is that this system operates automatically, and no electricity is required to activate it.